Eight boys and girls, ranging from S2 to S5, entered the School Heat of the Future Chef competition. 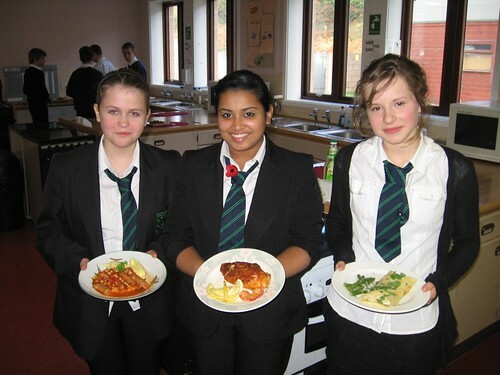 Pupils had one hour to prepare and cook a hot main course for 2 people within a budget of £4.The meals had to be plated up, ready for judging. Susan Kirkness – Rosie Smith’s Mother – kindly came in this morning to judge the dishes. As a result of Rosie’s participation in this event, she is now in London training with Michel Roux Jr.
Holly Morrison -Sausage and Haricot Bean Ragu with Mustard Mash. Holly will now get the chance to enter the competition at the next level. Thanks to Susan who judged this without any prior knowledge of who cooked what. Click on the photo above to see more pictures of the event.